A study conducted by global public relations firm Weber Shandwick has revealed a rising social movement ignited by the digital and social media era: employee activism. Employee activists draw visibility to their workplace, defend their employers from criticism and act as advocates, both online and off. One in five employees (21%) is estimated to be an employee activist, and another 33% have high potential to be employee activists. As the movement grows at an increasing speed, employers have an enormous opportunity to engage and capitalise on these powerful advocates, or risk missing out on an important group of supporters and, at worst, fail to curtail detractors who have the potential to upend company reputations. Weber Shandwick partnered with KRC Research to conduct the study, titled, ‘Employees Rising: Seizing the Opportunity in Employee Activism,’ through an online survey of 2300 employees covering 15 markets worldwide, the study explores the employee activist movement to help organisations understand what it takes to catch the rising tide of employee activism. “These findings are especially relevant for employers across Asia Pacific. Employees in this region are particularly passionate and will actively share their point of view. We know from our conversations with clients that employee engagement is top of their priority lists and building on employee activism is going to be a new way forward,” said Tyler Kim, head of corporate and crisis, Asia Pacific. 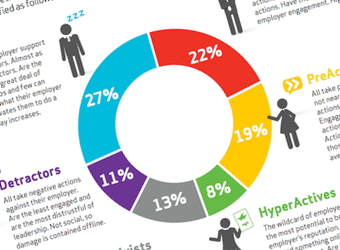 14% have posted something about their employer in social media that they regret. In Asia Pacific, this proportion is higher again with 20% admitting they’ve posted something about their employer in social media that they regret. Social encouragement has an outsized impact on employer advocacy among employees. For example, employees with socially-encouraging employers are significantly more likely to help boost sales than employees whose employers aren’t socially encouraging (72% vs 48%, respectively). The report provides many examples of the benefits of encouraging employees to “socialise their employer brands” and the simple ways in which employers are doing so. Pervasive organisational changes. More than eight in 10 employees (84%) have recently experienced an employer change such as a leadership turnover, extensive lay-offs, merger/acquisition, financial slowdown, etc. Employees are on the defence and often serve as “first responders.” Nearly six in 10 respondents (56%) surveyed have either defended their employer to family and friends or in a more public venue — such as on a website, blog, or in a newspaper.